Top entrepreneurs who sell online know one key fact: If your sales funnel isn't set up well, you won't drive traffic and you won't make much money. But if you do structure your business with an effective sales funnel for the products you sell, you can ramp up fast. If that sounds like an easier-said-than-done concept, you're probably not familiar with Russell Brunson. A top online marketer of supplements, Brunson now works with entrepreneurs looking to harness the power of direct marketing online. To get them there, Brunson offers a four-step process for building a rock-solid sales funnel to generate a steady stream of prospects--and then convert them into clients. 1. Find your dream client. This obvious-sounding step is so often overlooked or underappreciated by entrepreneurs, who tend to sell to anyone interested in buying. What happens is this "anyone who can fog a mirror" approach results in you waking up one day with a bunch of customers you don't like and don't really care to serve. The end result is a less successful business and a less enjoyable life. To avoid that, get crystal clear on who you want to work with--your ideal client profile. These will be the people who you most want to serve, who you can bring huge value to, and who you can serve profitably. Realize that by focusing your business on just ideal clients, you may be marketing to and working with a much smaller group of people than ever before. That's OK. In this case, less is more. By targeting exactly the right people for your business and leaving the rest to others, you will actually maximize your ability to succeed in a way that trying to work with absolutely anybody can't achieve. Tip: Be willing to give away this bait for free. That's what both Brunson and I do with our content in order to build large lists of prospects. We then offer additional content or solutions that are of even higher value for which we charge. But it's that initial complementary bait that enables us to attract tons of ideal clients to whom we can market on a regular, ongoing basis. 3. Locate where your ideal clients spend time online. Where do your dream clients congregate online--what groups on LinkedIn, Facebook and other social media--and what emails lists are they on? Those are the places where you will buy your ads and offer them your high-value, complementary bait. 4. Have a destination where you want to take them. What's the best result you can give someone? Says Brunson: "A product is kind of a means to the end. The end is the result they're coming to you for. In my case, they want to be able to transform their business. I don't have a product for that, but I have a process. We've got our high-end coaching, we've got our mentoring to deliver the best result we can." To really ramp up your marketing success, says Brunson, model your method on those who have gone before you and figured out what works--and what doesn't. "Whatever niche or client base you are pursuing, chances are someone else has done it and done it well already--so learn from the trail blazers," he says. To do so, Brunson says to think of yourself as almost like one of those secret shoppers who rates retailers' and restaurateurs' service--only you're checking out the competition. 1. Sign up for every email from the site you're secretly shopping. 2. Record and screen capture all of the pages on the site and any video/audio on those pages, so you can see exactly how they structure their offering. 3. Get those videos or audio presentations transcribed by an online transcription service. Learn exactly what they say in their marketing pitches, and how they say it. 4. Buy everything they're selling so you know exactly what deliverables they offer. Go slow at each step and really notice how they position themselves at each interaction throughout their sales funnel. Armed with this information, you can design an offering that has the key components that has already made someone else a lot of money. Brunson is quick to point out that this approach--which he calls funnel hacking--is not stealing. "It's really doing what most businesses do, which is to model an already proven framework--the layout, the price points, the types and frequency of email offers. That's 90 percent of your success if you get it right. But your content, your videos and your offering has to be 100% your own--that's where the creativity comes in, not in the structure." Give yourself the tools you need to accelerate your success like never before. 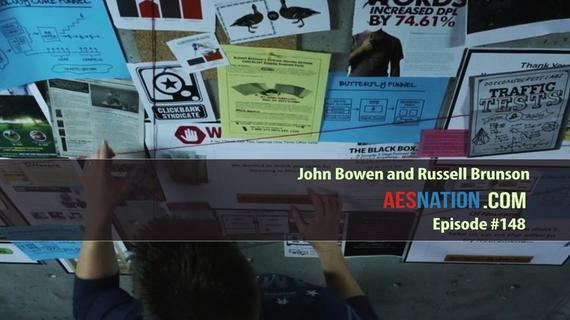 Check out the insights, tactics and actionable strategies from today's top entrepreneurs at AES Nation.